Announcing MSM Pureway-C® Complex™ from Maxi Health Research. It’s a combination of MSM (methylsulfonymethane) and Pureway-C® Complex™. Let’s take a closer look and see what these two ingredients are and why they are important to you. MSM (methylsulfonylmethane) is a supercharged source of biological sulfur, which supports the formation of healthy body tissues including the bones, joints, ligaments and tendons. PureWay-C® is an exciting non-acidic form of Vitamin C. It contains vitamin C-lipid metabolites. This non-acidic form of vitamin C supports delivery, availability, absorption, of vitamin C in the body. 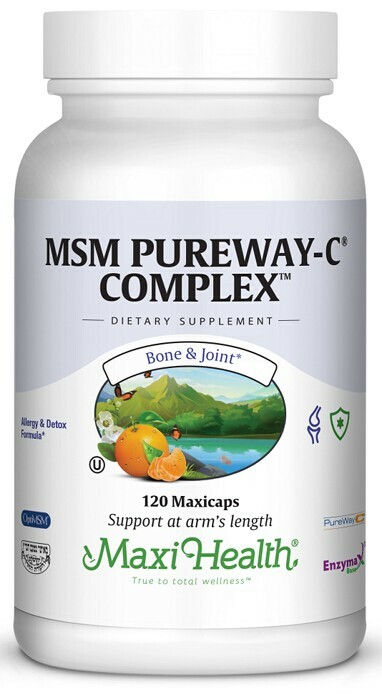 PureWay-C® can also support prolong blood plasma and tissue retention of vitamin C. It helps maintain the integrity of the connective tissues and to give support for sore muscles, occasional leg cramping, and fatigue.